A sack of "pink grain". Note the labelling in Spanish, and the grain's distinctive orange-pink colour. Images like this were suppressed in state media. The 1971 Iraq poison grain disaster was a mass methylmercury poisoning incident that began in late 1971. Grain treated with a methylmercury fungicide and never intended for human consumption was imported into Iraq as seed grain from Mexico and the United States. Due to a number of factors, including foreign-language labelling and late distribution within the growing cycle, this toxic grain was consumed as food by Iraqi residents in rural areas. People suffered from paresthesia (numbness of skin), ataxia (lack of coordination of muscle movements) and vision loss, symptoms similar to those seen when Minamata disease affected Japan. The recorded death toll was 650 people, but figures at least ten times greater have been suggested. The 1971 poisoning was the largest mercury poisoning disaster when it occurred, with cases peaking in January and February 1972 and stopping by the end of March. Reports after the disaster recommended tighter regulation, better labelling and handling of mercury-treated grain, and wider involvement of the World Health Organization in monitoring and preventing poisoning incidents. Investigation confirmed the particular danger posed to fetuses and young children. The properties of mercury make it an effective fungicide. However, in Europe and America, its health risks (even when consumed in small quantities) were known. Methylmercury had been banned in Sweden in 1966, the first country to do so, and the United Kingdom followed in 1971. Previous mercury-poisoning incidents had occurred in Iraq in 1956 and 1960. In 1956, there had been around 200 cases, and 70 deaths; in 1960 there had been 1000 cases and 200 deaths, in both cases due to ethylmercury compounds. Among the recommendations made after the 1960 incident had been to colour any toxic grain for easy identification. Before the 1971 incident, around 200–300 cases of methylmercury poisoning had been reported worldwide. Drought had reduced harvests in 1969, affecting 500,000 people, and in 1970. Saddam Hussein, as the government's no. 2 behind Ahmed Hassan al-Bakr, decided to import mercury-coated seed grain for the late 1971 planting season. Hussein himself may have worked in the Department of Agriculture in the aftermath of the 1960 incident. A map of Iraq (1976) showing the provinces referred to. Some 95,000 tonnes (93,000 long tons; 105,000 short tons) of grain (73,201 tonnes of wheat grain and 22,262 tonnes of barley), coloured a pink-orange hue, were shipped to Iraq from the United States and Mexico. The wheat arrived in Basra on SS Trade Carrier between 16 September and 15 October, barley between 22 October and 24 November 1971. Iraq's government chose Mexipak, a high-yield wheat seed developed in Mexico by Norman Borlaug. The seeds contained an average of 7.9 μg/g of mercury, with some samples containing up to nearly twice that. The decision to use mercury-coated grain has been reported as made by the Iraqi government, rather than the supplier, Cargill. The three Northern governorates of Ninawa, Kirkuk and Erbil together received more than half the shipments. Contributing factors to the epidemic included the fact that distribution started late, and much grain arrived after the October–November planting season. Farmers holding grain ingested it instead, since their own planting had been completed. Distribution was hurried and open, with grain being distributed free of charge or with payment in kind. Some farmers sold their own grain lest this new grain devalue what they had. This left them dependent on tainted grain for the winter. Many Iraqis were either unaware of the significant health risk posed, or chose to ignore the warnings. Initially, farmers were to certify with a thumbprint or signature that they understood the grain was poison, but according to some sources, distributors did not ask for such an indication. 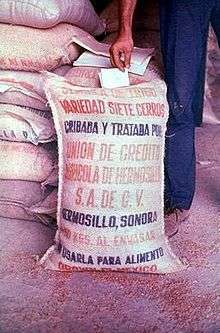 Warnings on the sacks were in Spanish and English, not at all understood, or included the black-and-white skull and crossbones design, which meant nothing to Iraqis. The long latent period may have granted farmers a false sense of security, when animals fed the grain appeared to be fine. The red dye washed off the grain; the mercury did not. Hence, washing may have given only the appearance of removing the poison. Mercury was ingested through the consumption of homemade bread, meat and other animal products obtained from livestock given treated barley, vegetation grown from soil contaminated with mercury, game birds that had fed on the grain and fish caught in rivers, canals, and lakes into which treated grain had been dumped by the farmers. Ground seed dust inhalation was a contributing factor in farmers during sowing and grinding. Consumption of ground flour through homemade bread is thought to have been the major cause, since no cases were reported in urban areas, where government flour supplies were commercially regulated. The effect of mercury took some time – the latent period between ingestion and the first symptoms (typically paresthesia – numbness in the extremities) was between 16 and 38 days. Paresthesia was the predominant symptom in less serious cases. Worse cases included ataxia (typically loss of balance), blindness or reduced vision, and death resulting from central nervous system failure. Anywhere between 20 and 40 mg of mercury has been suggested as sufficient for paresthesia (between 0.5 and 0.8 mg/kg of body weight). On average, individuals affected consumed 20 kg or so of bread; the 73,000 tonnes provided would have been sufficient for over 3 million cases. The hospital in Kirkuk received large numbers of patients with symptoms that doctors recognised from the 1960 outbreak. The first case of alkylmercury poisoning was admitted to hospital on 21 December. By 26 December, the hospital had issued a specific warning to the government. By January 1972, the government had started to strongly warn the populace about eating the grain, although dispatches did not mention the large numbers already ill. The Iraqi Army soon ordered disposal of the grain and eventually declared the death penalty for anyone found selling it. Farmers dumped their supplies wherever possible, and it soon got into the water supply (particularly the River Tigris), causing further problems. The government issued a news blackout and released little information about the outbreak. The World Health Organization assisted the Iraqi government through the supply of drugs, analytical equipment and expertise. Many new treatments were tried, since existing methods for heavy metal poisoning were not particularly effective. Dimercaprol was administered to several patients, but caused rapid deterioration of their condition. It was ruled out as a treatment for this sort of poisoning following the outbreak. Polythiol resins, penicillamine and dimercaprol sulfonate all helped, but are believed to have been largely insignificant in overall recovery and outcomes. Dialysis was tested on a few patients late in the treatment period, but they showed no clinical improvement. The result of all treatments was varied, with some patients' blood mercury level being dramatically reduced, but a negligible effect in others. All patients received periods of treatment interspersed with lay periods; continuous treatment was suggested in future cases. Later treatment was less effective in reducing blood toxicity. 6,530 patients were admitted to hospitals with poisoning, and 459 deaths reported. Cases reached a peak of hundreds per day in January, and had largely subsided by the beginning of March. 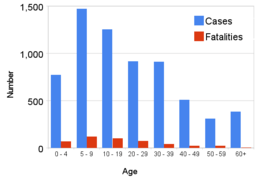 The last admittance was on 27 March; admissions represented every age and gender stratum, although those under the age of ten represented a third of admitted cases. This number is "certainly an underestimate", because of the availability of hospital treatment, hospital overcrowding and lack of faith in treatment. In the most severely affected areas, prevalence was 28% and mortality was 21% of the cases. Some Iraqi doctors believe both the number of cases and fatalities are at least ten times too low, with perhaps 100,000 cases of brain damage. One suggested reason for the vast discrepancy between reported and estimated numbers of deaths is the Iraqi custom, common to large parts of the Middle East, for a person to die at home when possible. Home deaths would not have been recorded. A large number of patients with minor symptoms recovered completely; those with more serious symptoms improved. This was in contrast to expected outcomes, largely based on analysis of Minamata disease in Japan. In boys with mercury levels below clinical poisoning, a reduction in school performance was noted, although this correlation could not be confirmed. In infants, the mercury poisoning caused central nervous system damage. Relatively low doses caused slower development in children, and abnormal reflexes. Different treatments for mercury poisoning have since been developed, and "quiet baby syndrome", characterised by a baby who never cries, is now a recognised symptom of methylmercury-induced brain damage. Ongoing recommendations of the food regulation authorities have focused on consumption by pregnant women and infant children, noting the particular susceptibility of fetuses and infants to methylmercury poisoning. Data from Iraq have confirmed that methylmercury can pass to a child in utero, and mercury levels were equal to or higher in the newborn child than in the mother. In 1974, a joint Food and Agriculture Organization (FAO) and World Health Organisation (WHO) meeting made several recommendations to prevent a similar outbreak. These included stressing the importance of labelling bags in the local language and with locally understood warning symbols. The possibility of an additive creating a strong bitter taste was studied. The meeting urged governments to strictly regulate methyl- and ethylmercury use in their respective countries, including limiting use to where no other reasonable alternative was available. It also recommended the involvement of the FAO and WHO in assisting national governments in regulation and enforcement, and the setting up of national poison control centres. Over 9–13 November, a Conference on Intoxication due to Alkylmercury-Treated Seed was held in Baghdad. It supported the recommendations of the FAO/WHO report and further suggested that local and national media should publicise outbreaks, including size and symptoms; it considered the distribution of this information crucial. It also laid out a general plan as to the collection of relevant information from the field and potential analysis for further investigation. It called on national governments to make use of WHO involvement whenever feasible, and absolved world governments in clear terms, saying that "No country should ever feel that any blame will attach to it for allowing an outbreak to occur". Iraq now has the highest incidence of Parkinson's in the world. Parkinson's symptoms are very similar to mercury poisoning symptoms. Mercury that enters the brain has a half-life of 27.5 years and chelators are not able to remove it. 1 2 3 4 5 6 7 8 9 10 Bakir F, Damluji SF, Amin-Zaki L, et al. (July 1973). "Methylmercury poisoning in Iraq" (PDF). Science. 181 (4096): 230–41. doi:10.1126/science.181.4096.230. PMID 4719063. Retrieved 11 June 2010. ↑ Matolcsy, György; Nádasy, Miklós; Andriska, Viktor (1988). "Mercury". Pesticide chemistry. Amsterdam: Elsevier. p. 294. ISBN 0-444-98903-X. ↑ United Kingdom Health and Safety Executive. Banned and Non-Authorised Pesticides in the United Kingdom. Retrieved on 13 June 2010. 1 2 Al-Damluji SF (1976). 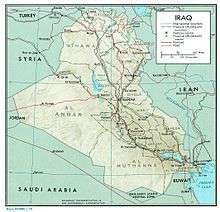 "Organomercury poisoning in Iraq: history prior to the 1971-72 outbreak". Bull. World Health Organ. 53 suppl: 11–13. PMC 2366396 . PMID 788949. ↑ Goodyear, EJ (2009). "The State of Disaster Risk Reduction in Iraq" (PDF). UN Inter-Agency Information and Analysis Unit: Iraq. p. 12. Retrieved 18 July 2010. 1 2 3 4 5 6 Jane M. Hightower (2008). "11". Diagnosis: Mercury: Money, Politics, and Poison. Washington, DC: Island Press. pp. 141–151. ISBN 1-59726-395-8. 1 2 Oller, J.W. ; Oller, S.D. (2009). Autism: The Diagnosis, Treatment, & Etiology of the Undeniable Epidemic. Sudbury, Mass: Jones & Bartlett Publishers. p. 156. ISBN 0-7637-5280-0. Retrieved 24 July 2010. 1 2 3 4 5 6 7 8 9 Skerfving SB, Copplestone JF (1976). "Poisoning caused by the consumption of organomercury-dressed seed in Iraq". Bull. World Health Organ. 54 (1): 101–112. PMC 2366450 . PMID 1087584. 1 2 Jernelov, Arne (2003-09-09). "Iraq's Secret Environmental Disasters". Project Syndicate. Archived from the original on 15 June 2010. Retrieved 10 June 2010. ↑ Heller, J.L. (14 January 2010). "Methylmercury poisoning". Medical Center. University of Maryland. Archived from the original on 28 May 2010. Retrieved 14 June 2010.